Irish Grid Reference: S 78911 92693. About ½ a mile northwest of Moone village, on Belan Avenue, Co. Kildare, Southern Ireland, is a 5th century monastic site with the lavishly sculptured ‘Moone High Cross’, a 9th century richly carved granite monument with numerous scenes depicted from the Bible. It is said to be the second tallest high cross in Ireland. There is a second cross but this only survives in parts. Also here are the ruins of a 13th century abbey church (which now houses the cross). A monastery or abbey was probably founded here after 431 by St Palladius (d c460), and in the 6th century this was named after St Columba. The ruined church stands over the foundations of ‘this’ early Celtic monastery. The little village of Moon, in the Valley of the river Barrow, is 3 miles south of Ballitore and ½ a mile south of Timolin, close to the R558 road. At the post office in Moone take the road opposite going northwest crossing over the R448, then shortly after go onto Belan Avenue, crossing over the river Greese, and then follow the lane until you reach the farm and old mill: the high cross is on the opposite side of these buildings at the west side. The high cross, also called St Columba’s Cross, stands inside the ruined 13th century abbey church which now has a glass roof over it. It is a 5.3 metre (over 17 foot) high granite cross of three sections with a long slender shaft that tapers away. The wheel-head, which might be of a later date, shows Christ crucified but this has suffered some damage. There are 51 sculptured panels on all four sides, each having richly carved decoration depicting numerous scenes and characters from the Bible, and also Celtic symbolism including animals, mythical and magical creatures and other figures, but also other decorative work. 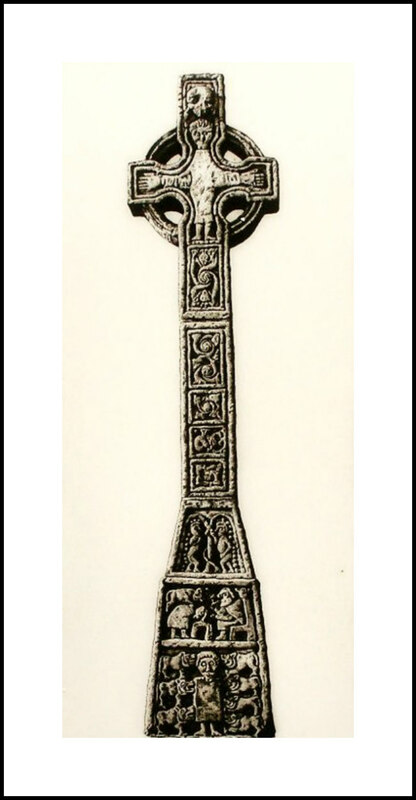 The cross is thought to date from the 8th or 9th century AD. In 1835 and 1893 sections of the cross were excavated from the church-yard and then re-erected, and more recently placed for protection against the elements in the ruined medieval church. The S. face shows The Temptation of St Anthony while below that four mythical serpents (snakes) are fighting with two open-mouthed lions or horses. Above those: SS Anthony and Peter and a raven bringing food. The N. face shows: The Miracle of the Loaves and Fishes, The Flight into Egypt, SS Paul & Anthony in the Desert and The Three Children in the Fiery Furnace. The E. face has a large panel at its base showing the twelve Apostles, each having a square-shaped body, stubby legs and feet and pear-shaped heads; they all appear to have a slightly different facial expression! Above that: Christ being crucified (he has long outstretched arms), angels, a lozenge shape (diamond) and a whirligig (an object seen to be whirling or spinning around). The W. face shows: Daniel in the Lions’ Den (he is surrounded by seven hungry, open-mouthed lions), The Sacrifice of Isaac, Adam and Eve (with apple trees); also monsters interlinked with heads, and Christ and a Dolphin (above). There is also part of a holed cross in the church. This only has a short section of its shaft left and three sections of its wheel-head remaining; but the carvings on this cross are very similar and equally as good as those on the high cross. The carvings on this cross are: mythical and magical creatures, spirals, swirls, intertwining foliage, knotwork and interlacing. Although the 13th century church is ruined it still possesses ‘antae’ (projecting walls) at its gable ends, according to Nicholson’s Guide (1983). Katharine Scherman (1981) says of the Moone High Cross that it is: “The most attractive of the Barrow crosses is the one at Moone, which, though the representations are no less naïve than those at Castledermot and other Barrow localities, has an entirely original and ingratiating charm. The cross is unusual in its shape, its tall slenderness accentuated by a long, tapered base. On the shaft are panels containing graceful, active and nearly recognizable quadrupeds. The Bible tales, scenes of spirited imagery, are on the four sides of the base. They include Adam and Eve—two small fat people framed by arches of apples; Daniel in the Lion’s Den—a figure in a square garment, like a paper doll, in a frame of seven openmouthed lions, four down one side from his ear to the hem of his dress, three down the other; the Twelve Apostles—twelve identical square men with pear-shaped heads and circle eyes, looking like three rows of cookies; the Miracle of the Loaves and the Fishes—five loaves, two fishes and two eels all by themselves in a pure and simple design. “Homage is paid to those early anchorites St. Anthony and St. Paul, patrons of the monastic life. One panel shows their meeting in the desert: seated facing each other on straight-backed chairs, they break bread together. Another depicts St. Anthony—the rectangular saint beset by two rectangular visions , one with the head of an animal, the other of a bird. The panel below these two religious ones has an unscriptural scene of animals with the heads of horses and the bodies of serpents locked in an inextricable coil of combat; unlike the squared representations of humans, the artist carved his animals in sinuous curves. All the scenes are executed with a kind of childlike artfulness so that they fit exactly into their frames: the animals arch into the corners; the humans have round heads (the males’ are elongated by their short oval beards into teardrop shapes) and rectilinear torsos to fill the squares, and all their feet are turned side-ways, like those on Egyptian friezes. Nicholson’s Guides, Guide To Ireland, Robert Nicholson Publications Limited, London, 1983. Reader’s Digest, Illustrated Guide To Ireland, The Reader’s Digest Association Limited, London, 1992. Scherman, Katharine, The Flowering of Ireland, Victor Gollancz Ltd., London, 1981. Categories: Ancient Crosses, Monastic Sites | Tags: Moone High Cross in Co. Kildare in Southern Ireland | Permalink.